1. What is an Index Organized Table (IOT)? An Index Organized Table (IOT) is a table that is sorted internally as an index. 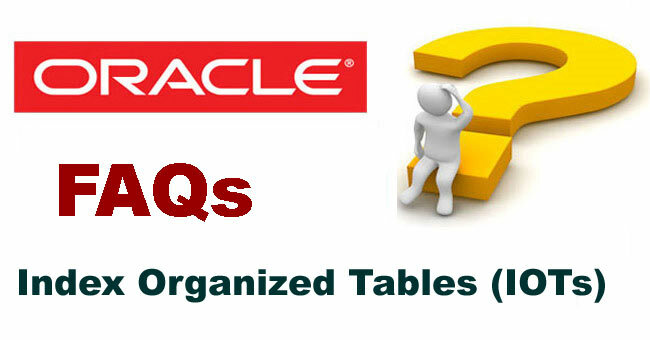 Other database systems such as MAXDB or DB2 use IOTs by default, whereas on Oracle, you must configure this function explicitly. 2. What are the advantages of IOTs? The IOT combines a table and index in one, saving you the effort of creating an index. Queries using the fields of this index result in fewer block accesses, since all of the information is already in the index blocks and an additional access to table blocks is no longer necessary. This fact means there are significant performance gains, especially when compared to indexes with a high clustering factor. The higher the number of blocks that have to be read on average from the hard disk (see also Note 832343), the more important these gains. Related: Indexes in SAP: What are They and How to Create and Use them? 3. What are the technical attributes of an IOT? The IOT is always defined on the basis of a PRIMARY KEY constraint. In just the same way as the UNIQUE KEY constraint, a PRIMARY KEY constraint requires unique combinations of the indexed columns. However, NULL values are not allowed in the indexed columns. All data is stored in the index. The IOT table is in the database, but does not occupy any space in the database and is therefore not a segment. To avoid having to store too large data records in the index, you can define an overflow segment when creating an IOT in which the last columns of long data records are stored. If secondary indexes are defined on the IOT, the fields of the PRIMARY KEYs are always stored at the end of the secondary index entries. Secondary indexes accessed the IOT using Logical ROWIDs that provide a "Guess" for the correct data block of a data record in the IOT. 4. What restrictions are associated with using IOTs? Before you can create a PRIMARY KEY constraint, there must be one or more columns with unique value combinations that do not contain any NULL values. The maximum length of a table entry is limited to slightly less than half of an index block (for example, 3215 bytes). When you try to define an IOT with table rows or index fields that are too long, errors such as ORA-01429 or ORA-01450 are generated. If there is already a PRIMARY KEY constraint for the table, you cannot create another PRIMARY KEY constraint as the basis for the IOT. In this case, you must check whether the existing constraint is required at all. For example, PRIMARY KEY constraints were added to the SAP primary indices with earlier R/3 releases. However, these constraints are not required for SAP operation and can be deleted if required. With newer releases, PRIMARY KEY constraints are no longer created on SAP tables. The storage requirement and the growth of the IOT may be significantly higher than for a normal table because indexes generally fragment more easily than tables. Since the PRIMARY KEY columns are also included in the secondary indexes, these indexes require proportionately more space. A defragmentation of the relevant index using REBUILD or COALESCE is not possible. A MOVE ONLINE can be carried out instead, however. Columns of the ROWID type cannot be defined. Parallel Data Manipulation Language (DML) is not possible for IOTs that are not partitioned. Therefore, for example, long unavoidable runtimes may occur with DBMS_REDEFINITION.START_REDEF_TABLE if the target object is defined as an IOT and a large number of data records must be inserted. If you use IOTs on Oracle 9i and upgrade to 10g, data may become corrupt. For more information, see document 1135589. 5. How does SAP support IOTs? Such an IOT cannot be created as part of transports. Activation in an SAP system results in an ORA-02264. A table conversion (for example as part of updates) cannot be executed automatically. Instead, the conversion must be manual. 6. Can the PRIMARY KEY of an IOT differ from the SAP primary index? The PRIMARY KEY constraint underlying an IOT does not have to be the same as the primary index of the table on the SAP system. For example, if you have performance problems in the availability run, you can support important RESB accesses with MANDT and MATNR using an IOT with the PRIMARY KEY constraint using MANDT, MATNR, RSNUM, RSPOS and RSART, while the primary index only contains the columns MANDT, RSNUM, RSPOS and RSART. Note, however, that such a setup is not supported by ABAP DDIC (see above). 7. How do I create an IOT? You can define the primary key constraint using CONSTRAINT. The ORGANIZATION INDEX option indicates that it is an IOT, not a normal table. If the above IOT is filled with data, these are stored directly in the index and not in the table. 8. How is an IOT accessed? If Oracle decides on a "Full Table Scan", this corresponds to an Index Full Scan or an Index Fast Full Scan in the case of an IOT because the data records are stored in the form of an index. If the PRIMARY KEY on which the IOT is based is used for the access, this is the same as an Index Range Scan or Index Unique Scan on the IOT. There is no need to perform a final table access via ROWID because all data is already in the index. The index is searched (as part of an Index Range Scan or similar) for appropriate data records. Both columns from the index itself and the columns from the PRIMARY KEYs can be analyzed in this case because these are also stored in all indexes. If required, a guess is used to determine a data record directly in the IOT for each suitable data record. The guess is based on a logical ROWID, but this may rendered invalid in certain situations (such as block splits, for example). If the guess is not valid, the related IOT record is determined using an Index Unique Scan on the PRIMARY KEY index. This type of access is therefore more like a Nested Loop Join (with the PRIMARY KEY columns as join conditions between PRIMARY KEY index and other index) than a normal index table access. 9. How can I check the validity of logical ROWIDS? For values close to 100 %, no action is required. For values below 90 %, the logical ROWIDS (see below) may be updated. Note that the values are only as current as the corresponding CBO statistics. If in doubt, create new CBO characteristics for the IOT in advance. 10. How can I update the logical ROWIDs? 11. How can I reorganize an IOT? Note that double the space is temporarily required in the tablespace for this reorganization. 12. How can I check whether (and which) IOTs exist in the system? In this case, TABLE_NAME contains the name of the table, while INDEX_NAME is the name of the index that supports the PRIMARY KEY constraint and contains all the data. 13. How can I monitor IOTs? 14. Why does an ALTER INDEX return the error ORA-25176? If you encounter this error, you must adapt the IOT instead (using ALTER TABLE). If R3UP encounters this problem during an upgrade, import a current version of R3UP that is no longer affected by the problem. 15. Where do IOTs SYS_JOURNAL_ and indexes SYS_IOT_TOP_... come from? Indexes of IOTs are created under the name SYS_IOT_TOP_ ... if no explicit name was entered during the definition. You can now search in the alert log for error entries (from which you can usually see the affected index) for the period in question (and subsequent hours). 16. How exactly is an IOT converted? Confirm the selection menu with "c". Remove "PCTUSED" including the number that follows. If the IOT index replaces an older secondary index, you must delete the CREATE INDEX statement from the ddl.sql script. You can then continue the BRSPACE reorganization using "c". 17. Where can I find more information about IOTs?